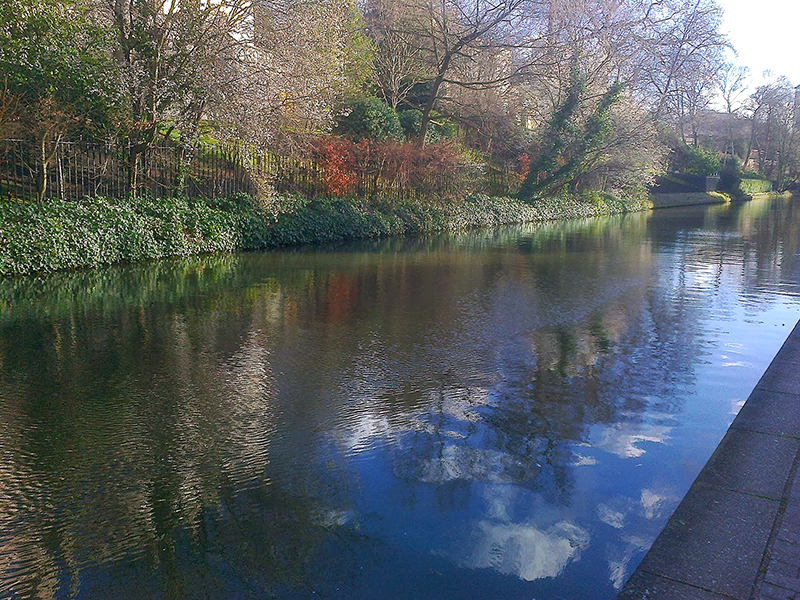 Today’s guest picture from my sister Mary shows some reflections on the Regent’s Canal. 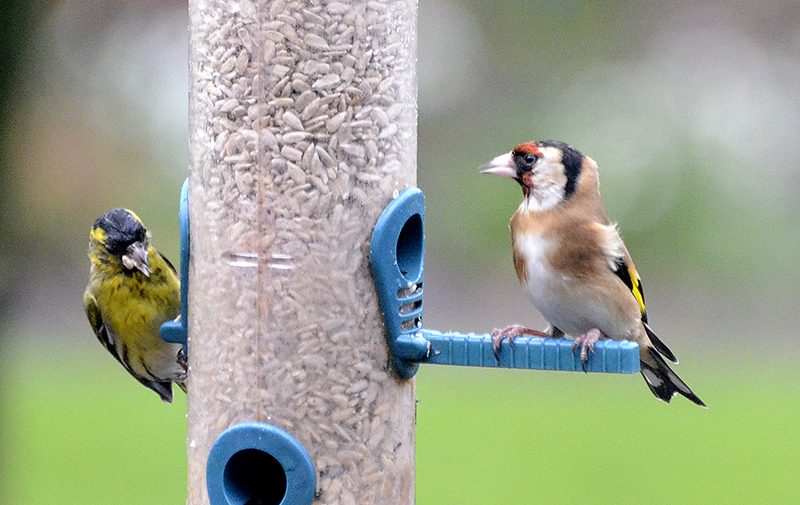 The day started with s stiff breeze and a good deal of rain but the breeze was quite a lot less strident than yesterday’s near gale and the garden was full of goldfinches as a result. They didn’t always seem very happy about the rain though. 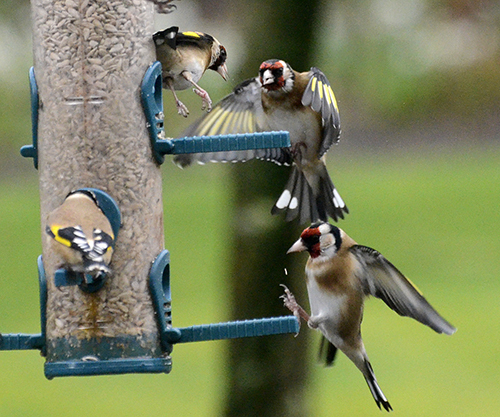 This one was joined by a lone siskin visitor. 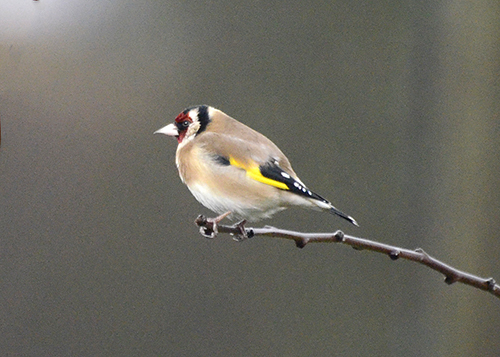 I had to go up to see my friend Arthur on a matter of computer assistance and by the time that I returned, the rain had begun to slack off and the light had improved enough to make watching the goldfinches with camera in hand a sensible thing to do. …and others were more chilled out. …but mostly they were busy. 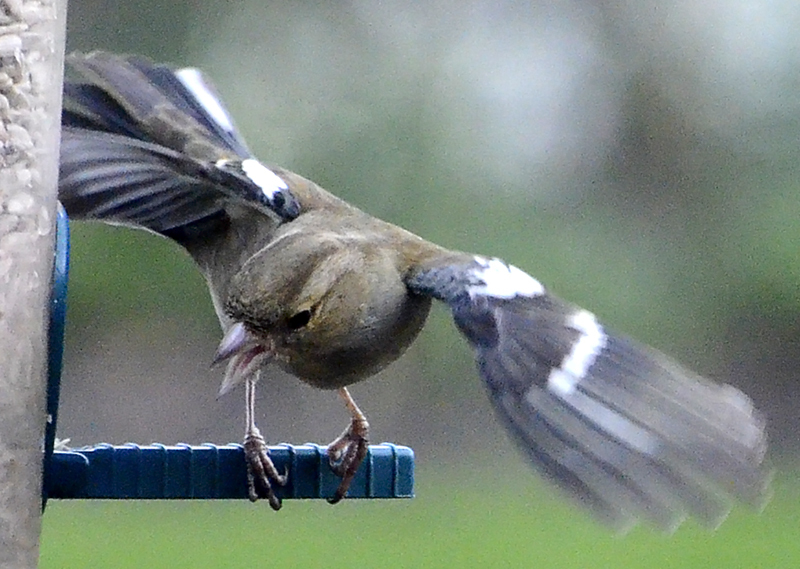 There were chaffinches about too in typically feisty form. 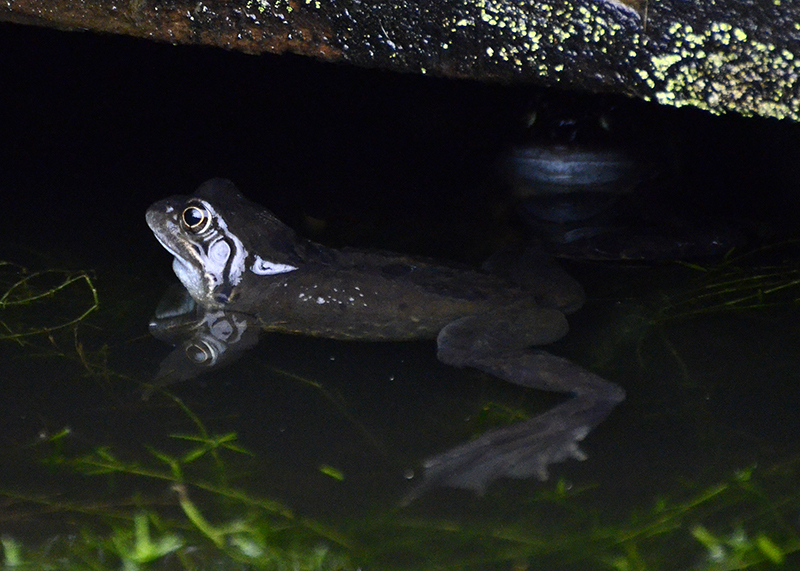 You can see from the pictures that there was even a hint of sun so I stepped out to visit the froggery. This one had a minder in the background. After lunch, Mrs Tootlepedal went off to work again in order to keep me in the style to which I am accustomed and I got the speedy bike out and resolved to see how strong the wind was. It was very strong in gusts but the gusts were reasonably far apart and the base wind speed was tolerable. I was feeling a lot better than I was when had to give up on Saturday and had enough energy to jump off the bike on several occasions to take a picture (or two). I hadn’t decided how far or where to go before I set out but as the ride went on, the reasonably warm temperature (8 degrees C), the moderate wind and the high clouds with occasional patches of blue sky led me on and on and I ended up doing a loop of thirty miles. The wind got stronger as I went round but fortunately by the time it was at its fiercest, I was heading for home with the wind behind me. The first 6 miles uphill and into the wind took me a good length of time as I pedalled well within myself to avoid getting too tired. This led to a slow overall time but an amazingly pleasant ride as I had plenty of energy left even when I had finished. 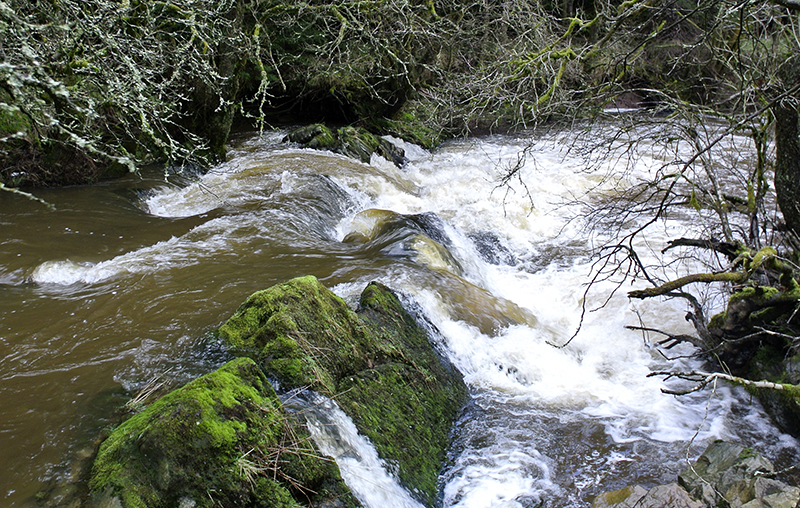 My first photos were on a watery theme with two of my favourite little cascades on the Wauchope and a picturesque puddle being ruffled by the wind. 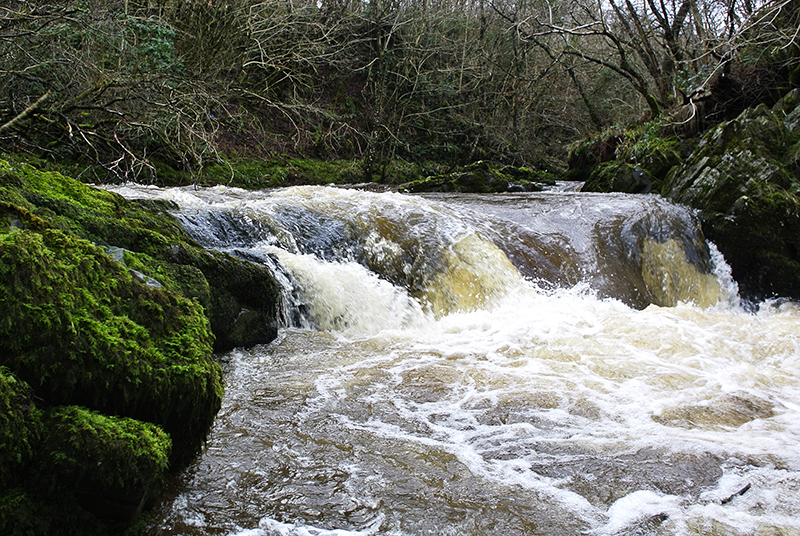 There was plenty of water going down the river. And in the fields all round my journey. 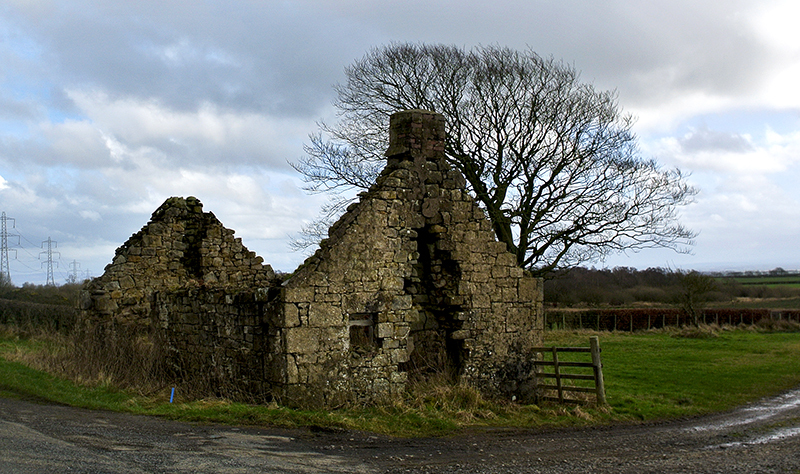 I passed this ruined cottage between Kennedy’s Corner and Chapelknowe. After passing through Glenzier, I decided to take the morning run route home past the Kerr. There had been signs saying that the road would be closed and I wanted to check this out. 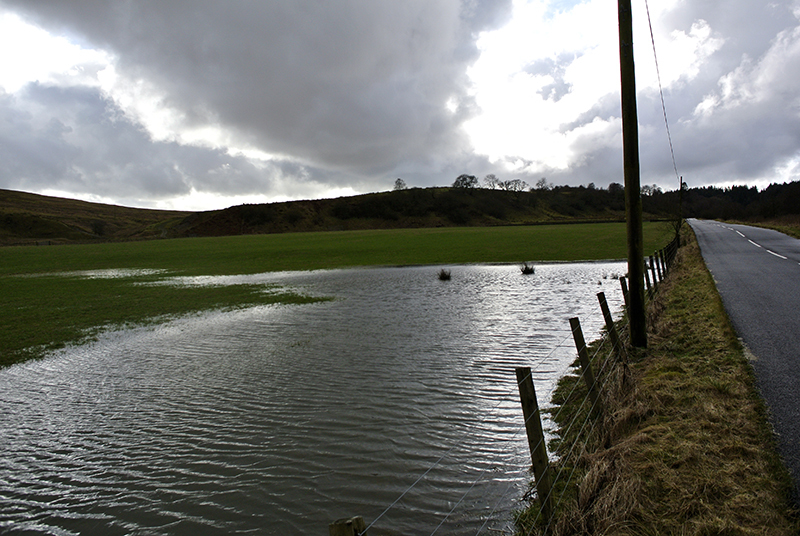 The road past Ryehills was closed and I had to take a small diversion past Tomshielburn and Barnglieshead. 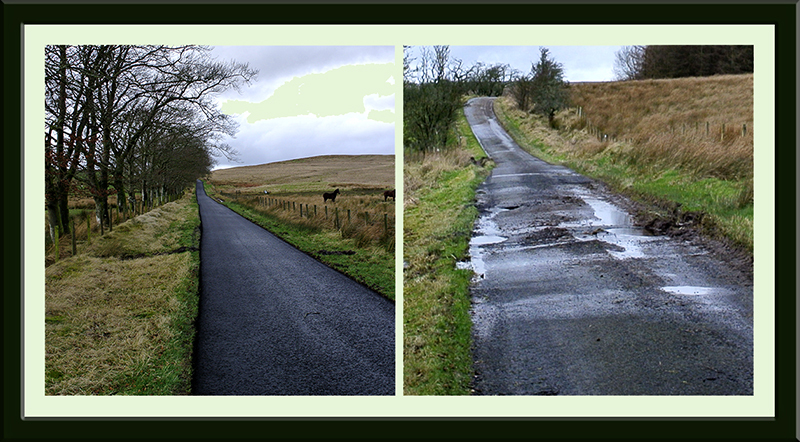 This road had been closed earlier and I was keen to see what sort of job had been done on it. Parts had been gloriously resurfaced…. …but parts had been left without improvement at all. The ways of the roads department are a mystery to us all. 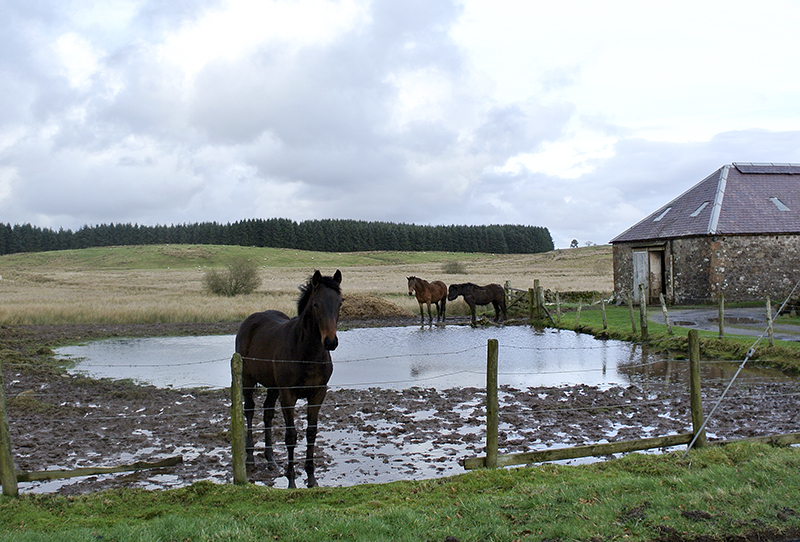 The horses at the back would have come to see me but they had lost their water wings. 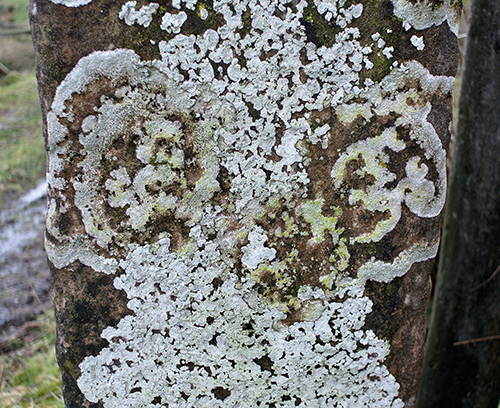 …and some fine lichen on an old gatepost. You could read all sorts of things into these patterns. I can see Punch and Judy. 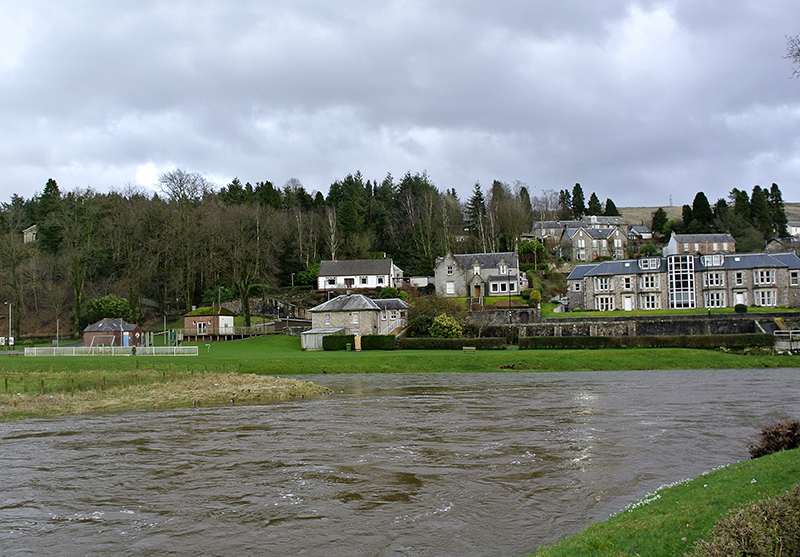 I finished my ride with a look at the Esk in langholm. In spite of all the rain and puddles, the river hasn’t looked like flooding. It is quite full though. 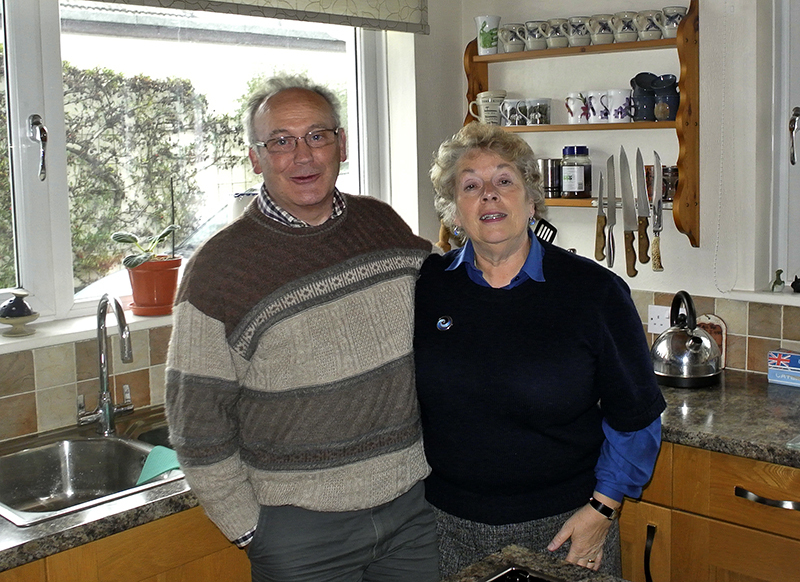 I dropped in on Maisie’s grandparents who have returned from New Zealand and was greeted with a cup of tea and some welcome ginger biscuits. I took a picture to prove that they had got back safely. You can tell from their naturally relaxed manner just how good I am at putting my portrait subjects at ease. They are not at all jet lagged. In the evening, I went across to Newcastleton with Sandy for a meeting of the camera club. We both had several pictures in the competition and the judge truly loved out work. He said so several times. Sadly, he loved others’ work even more and we didn’t trouble the scorer as they say. 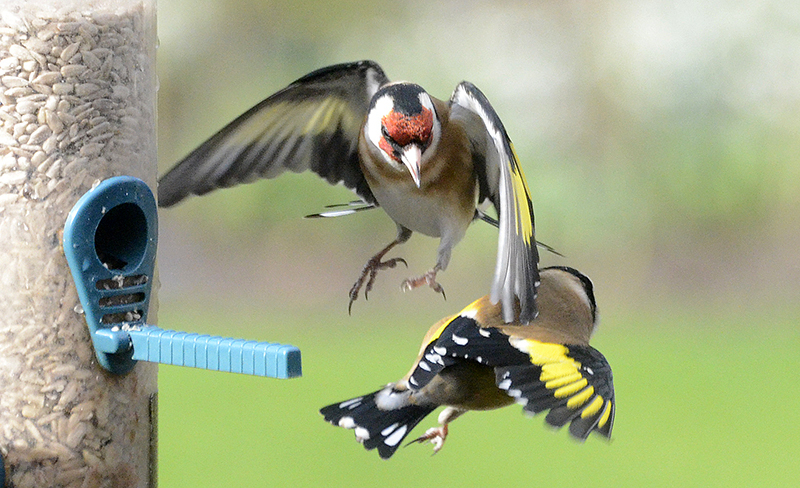 He showed us some of his own work as an entrant in top competitions and as they included a great shot of a goldfinch, I considered him a wonderful photographer. It was a treat to look at his pictures and to hear his remarks ab0ut ours so Sandy and I came home well satisfied. 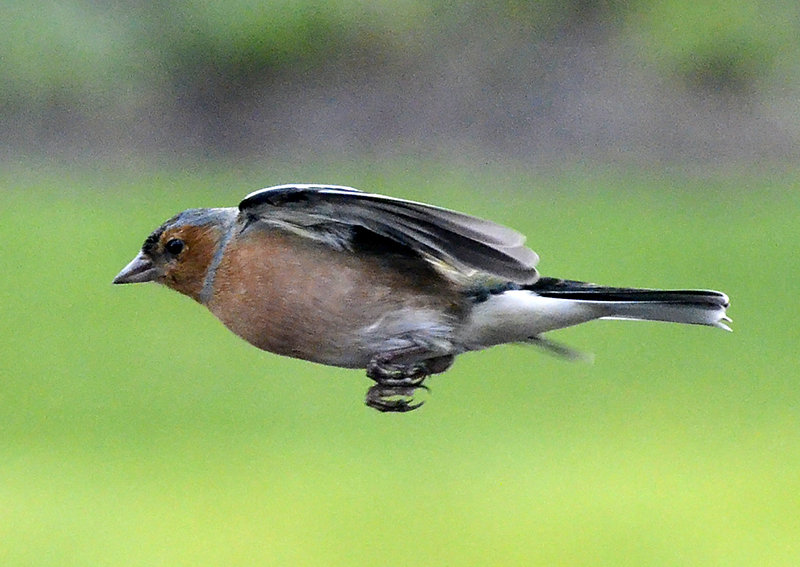 In spite of all the goldfinches, a neat chaffinch sneaked in as flying bird of the day.